*Please note, for security reasons we will only every use the link posted here for expression of interest, please do not use any other link. Congrats guys! Going to give a coupon code for those who want to make use of a early bird discount. For those listing, Demo will be sent directly to you. 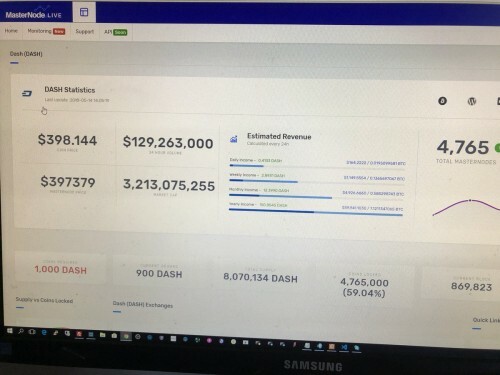 Great to have dash listed on masternode.live!! Glenn Fantastic News. I m liking what the Stipend Platform will be offering. Will be watching this one. CliffonCrypto thank you means a lot for the whole community, let me know if there is a way we can work together, maybe an interview or a webinar ! Keep up the great work guys, the masternode arena need some cleaning up ! Saad-Stipend sure would love too. Got some travels coming up then straight after that im happy to look at it. Love this cliff! How do we go about a listing? You can chat to Glenn or make use of the "get listed" function when we go live. Just note tho Cobra that we really aiming at quality nodes that offer real value. So just a heads up. We will be live soon to public. we busy with the listings. Hi Guys, would like to see SmartCash listed on there. Its a coin that has done a lot of development over and above the masternode and is a community based coin with lots of projects on the go and is reaching out into north Africa to help poorer communities. I notice on many masternode sites including this site, ZENCASH is never listed. That needs 42 for a node. At current prices its around $USD1,200. Good project, lots of social media and discussion and wallets on various platforms. I hope you're all doing well. I've recently joined the Apollon team as VP of Projects and I'm interested in getting a discussion going re getting Apollon listed on your site. Am also keen to understand the methodology you use to vet coins. Perhaps we can chat directly over DM rather than clog up this topic? Hit me up so we can discuss further. Hey Ade, I'm also interested to get Apollon listed and reviewed on this site. As I now have 2 XAP Masternodes hosted through Midas so I constantly get my XAP payouts re-invested and compounded daily. Apollon is actually a well-kept secret. I only found it because of Stipend. Holding Medic masternodes I was referred to Stipend as a valuable reliable complement to Medic MNs, Upon research, I came to learn that SPD is hosted on the XAP Nodebuilder platform. That was quite a revelation to me that few people know or understand. POW rigs are giving way to POS and MN adoption and development is the future. I will watch XAP closely because I would want to invest in all the different MNs that are listed on XAPNodebuilder platform. LuiRj PAC Coin now listed!